Are you accepting new dental patients? Yes, Doria Dental is accepting new dental patients at our Bayonne dentist office that is near to the highway, mass transit and the cruise ship port. Our highly trained and caring dental team is equipped and ready to take care of your entire family. We will use our gentle care and delicate touch to protect your smile. We offer a full range of family care and cosmetic dental services. We also accept walk-in and emergency dental care. What do I need to bring to my first dental appointment? Bring yourself and if you have a dental insurance coverage please bring your insurance card. You will need to fill out our new patient form (which you can do before you arrive). If you are coming for a second opinion, you might want to bring any previous x-rays to aid with our consultation. What are your hours at the Bayonne office? Doria Dental has convenient morning, evening and weekend appointments available. We are committed to finding a time that works for your busy schedule. What age should children start visiting the dentist? Doria Dental is your full service dentist office protecting your entire family’s smile. We encourage parents to bring their children to our Bayonne office as a toddler. We want to help educate you the parent about taking care of toddler teeth and also show your children their is nothing to fear in a dentist office. We will show your child the tooth tickler, our water gun and our exciting moving exam chairs. When your child sees how comfortable Mom and Dad are in the dentist office, it creates a calm and comforting tone for a lifetime of positive dental experiences. Unfortunately, too many 1 year olds are starting to get cavities in their baby teeth. Cavities are painful and dangerous infections which can suppress the immune system. So don’t wait to bring in your child to the dentist so they become more comfortable and you become more informed how to protect their teeth. Most families begin regular check-ups for their children around 18 months. If you see any spots on their baby teeth or anything unusual you shouldn’t wait and make an appointment. What payment options are available for my treatment? Doria Dental is happy to accept a wide variety of payment options for all of our patients to cover any part of their dental care that might be uninsured. We are one big family at Doria Dental and will take care fo you like family. We will happily work closely with all of our new and current patients to ensure treatment plan fits your individual dental needs and your financial situation. Our Bayonne office accepts major credit cards, and we can offer payment plans as well as stagger more extensive treatment into different phases to help our patients maximize their hard earned dental insurance benefits. Don’t see your question here? Call our office at 201-823-9100. Rita our Lead Patient Concierge will he happy to help you for the healthiest and brightest smile. 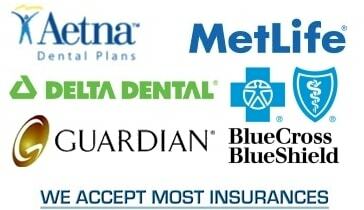 Dental Insurance Plans All major insurance plans accepted including Metlife, Aetna, Guardian, Delta Dental, Blue Cross & Blue Shield, Cigna and many more. Dental Emergency? We are happy to accept dental emergencies and relieve your dental pain. Call us at 201-823-9100 for help.